February 27, 2019 – Driven by the desire to support young designers, 24 Sèvres has announced its support for the 6th edition of the LVMH Prize. 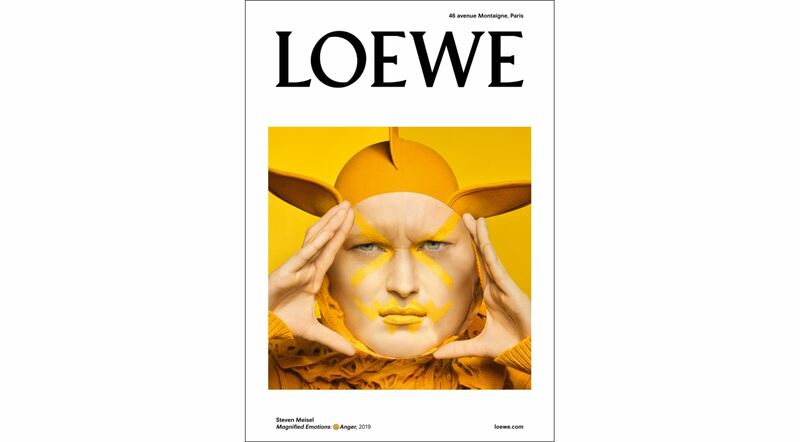 Launched in 2014, the Prize rewards one young designer for his or her talent and exceptional creativity. This year, it will also be spotlighted on 24sevres.com, with a dedicated site section and the distribution of several product lines, in an effort to provide the participating candidates with a global platform. The Prize semi-final will take place on March 1st and 2nd in Paris, where a committee of industry experts will select 8 finalists among the 20 participants. 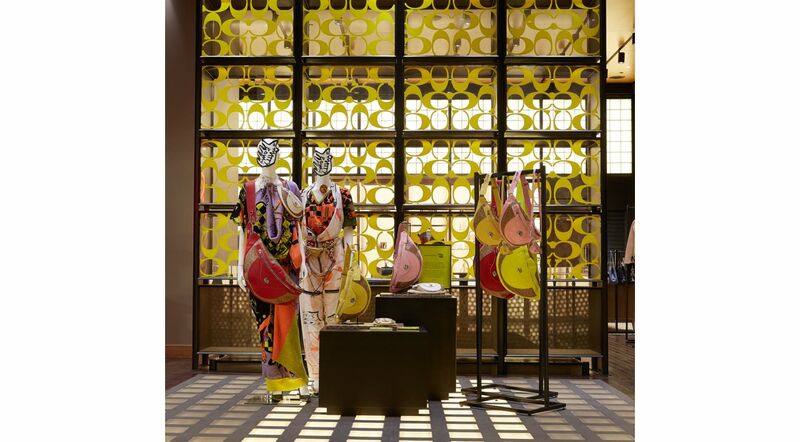 The finalists will go on to develop an exclusive capsule collection, which will be distributed on 24 Sèvres in June. 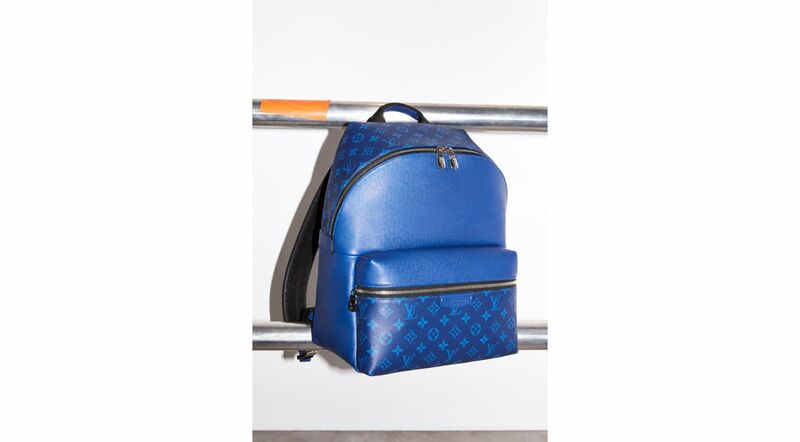 The winner of the Prize will be announced mid-June and receive 300,000 euros in funding from the LVMH Group, as well as a year of mentorship across a number of areas. 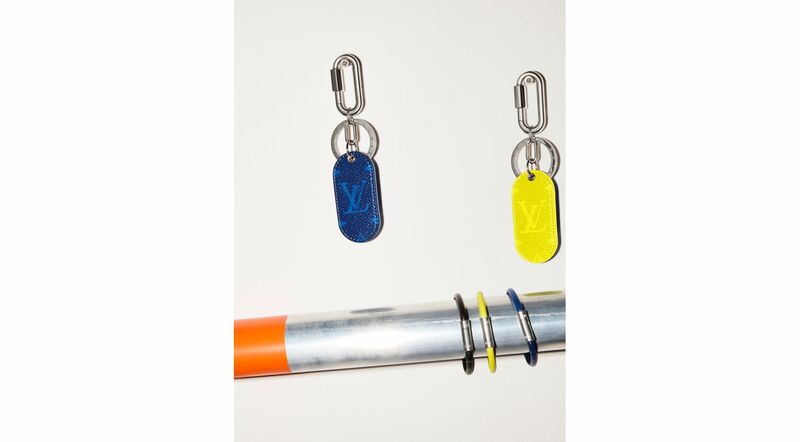 The winner’s capsule collection will also be distributed on 24 Sèvres in the fall. For this 6th edition, the jury counts 63 industry professionals, including Suzy Menkes, Imran Amed, Derek Blasberg, Karlie Kloss, Carine Roitfeld and Aimee Song. 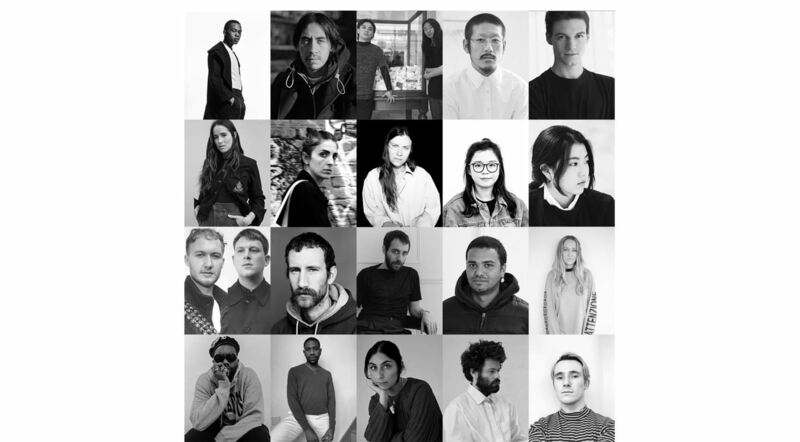 Among previous LVMH Prize alumni, some names of note are already available on 24 Sèvres: Jacquemus, Simone Rocha, Off White, Madga Butrym, Koché and Aalto were all past participants of the Prize and have been available on the site since its launch in 2017. 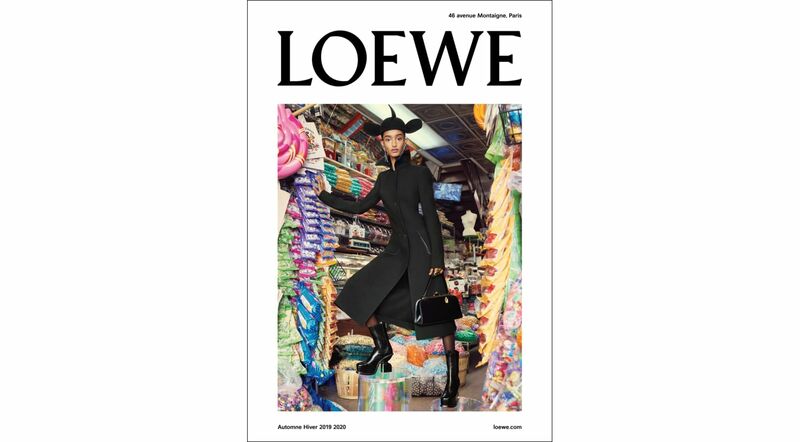 LOEWE unveils new images from its Fall/Winter 2019 campaign as posters across the city during Paris Fashion Week. 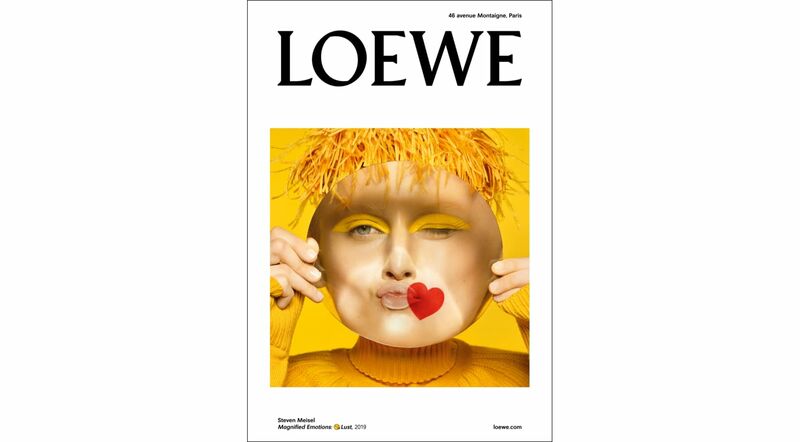 Photographer Steven Meisel continues his collaboration with LOEWE through a series of colour portraits inspired by emoticons, entitled Magnified Emotions. Holding a giant magnifying lens, model Julia Nobis expresses lust and anger against a striking yellow background, giving new context to this contemporary form of communication. The portraits are accompanied by a fashion photograph taking place in an overflowing candy shop. In the new image, model Mona Tougaard wears a tailored black coat, platform boots and felt ‘propeller’ hat, inspired by Coret, a mid century hat maker from San Francisco, creating a strong silhouette in the playful setting. She carries the Box Calf Lantern bag, a tribute to the Straeter Lite-On, a classic handbag from the early 1950s containing a battery powered light mechanism operated with a switch in the clasp, that the house has revived for today using its advanced craft knowledge. In celebration of the craftsmanship of the product itself, a still life of the calf Lazo Bucket bag completes the campaign. 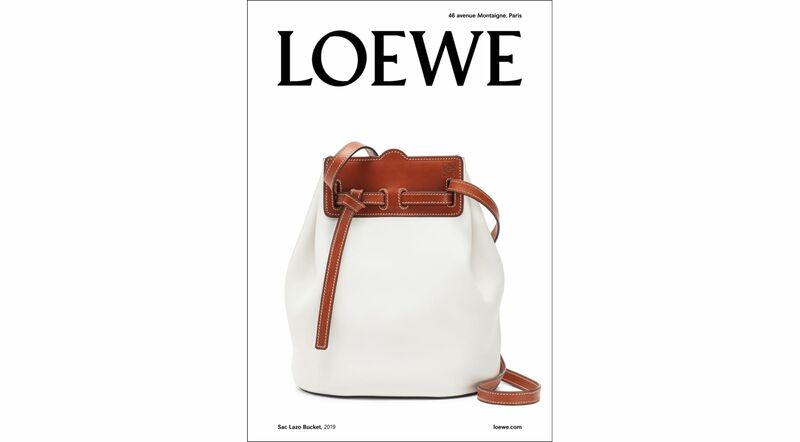 A new shape for Fall/Winter 2019 and introduced in the last show, the Lazo is an understated shoulder piece crafted from calfskin in a contemporary bucket style. From February 25 th 2019 until March 6 th 2019, during Paris Fashion Week, British fashion’s rising star Matty Bovan will take over the windows of the Coach Paris Flagship store at 372 Rue Saint-Honoré. The unique window and in- store display has been artistically curated by Matty Bovan in celebration of the Coach store launch of COACH x Matty Bovan limited edition accessories collection. 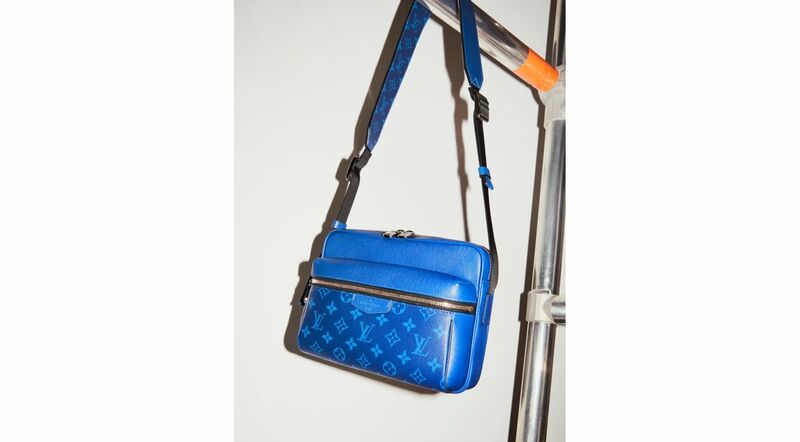 Designed with Matty Bovan’s unique flair, the window will feature spectacular looks from his London Fashion Week Spring/Summer 2019 collection, including off the runway COACH x Matty Bovan Campus belt bags. This belt bag collaboration sees Matty Bovan remix Coach’s heritage Signature logo print canvas with unexpected colour trims: true red, sunflower, blush, neon yellow and chalk white across extreme size proportions – from super mini to XXL. The accessories collection was previously worn by Georgia May Jagger, Winnie Harlow, Fran Summers, Lily Nova, and Dree Hemingway on the Matty Bovan Spring/Summer 2019 catwalk during London Fashion Week. The original Coach Signature logo print first debuted in early 2001 and has been an integral part of Coach’s heritage for almost two decades. Stuart Vevers has updated the Signature logo print for a contemporary, subtle feel, using a richer tan palette and a smaller logo. The COACH x Matty Bovan Signature Campus belt bags will be available exclusively from 25 th February 2019 at the Coach Paris flagship store and Coach House on Regent Street, London from 295 Euros/250 GBP. On February 22, Ralph’s Coffee will open on for a limited time on the legendary boulevard SaintGermain, on the ground floor of the Ralph Lauren boutique during Paris Fashion Week. Building on the success of the newly opened locations in New York, Tokyo and Hong Kong, and the iconic Ralph’s Coffee Truck in Rockefeller Center, Ralph’s Coffee will come to Paris for the first time. The shop will serve Ralph’s Coffee, Hot Chocolate and a selection of Teas along with some of Ralph Lauren’s favorite sweet treats. Ralph’s brownies, homemade muffins, cookies, caramel popcorn, yogurt parfait as well as Ralph’s signature 5 layer chocolate cake will be available a la carte. Ralph’s special blends—Ralph’s Roast, Decaf, and Espresso—are made from USDA organic coffees and feature organically grown beans from Central and South America and Africa. The beans are roasted and packaged in the US by La Colombe, and the all-natural Swiss Water Process is used to decaffeinate. The warm and elegant shop features large cozy banquettes, marble topped round tables, antique bistro style chairs and a generously filled counter. The waitstaff will wear Ralph Lauren white Oxford shirts and knit ties in the Ralph’s Coffee signature green, along with denim and butchers’ aprons embroidered with the Ralph’s Coffee logo. Ralph Lauren is continuing to engage consumers with experiential and unique expressions of the brand through the hospitality portfolio. Ralph’s Coffee represents the timeless American spirit of the brand with a fresh and authentic atmosphere, most recently serving as the backdrop for the Spring 2019 Collection show during New York Fashion Week. 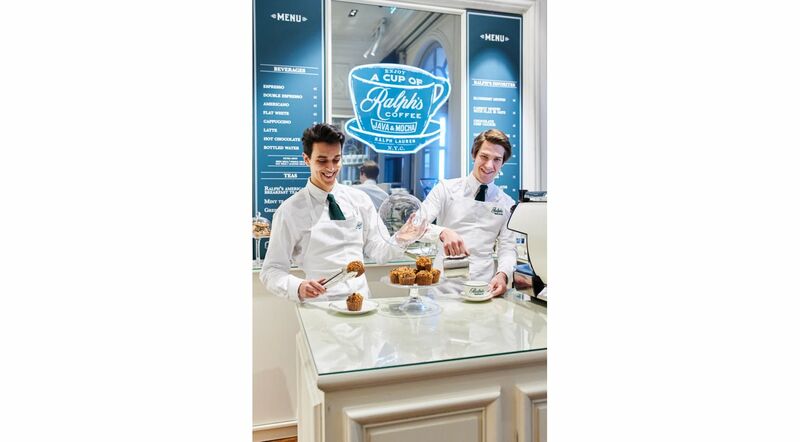 Ralph’s Coffee will be open for the duration of Paris Fashion Week, from February 22 to March 5, 2019. Paule Ka celebrates its 30th anniversary with a collection of 30 iconic looks created by its founder, Serge Cajfinger. The 2019 spring-summer collection, designed by its founder and artistic director, Serge Cajfinger, for the 30th anniversary of the fashion house Paule Ka, is an ode to this woman: “inspired by the years when I myself was 30. A hymn to love, sensuality, freedom, and the joy of living. I had a wonderfully good time recreating the festive spirit that reigned at Studio 54 in New York, at the Palace, or at the Bains-Douches in Paris. I added the graphic style I love from Greece, without forgetting the masculine-feminine theme or the little black dress, a must-have for every wardrobe.” The English photographer Charlotte Wales, who transformed this collection into image, is known for shots both feminine and trendy and that grace the pages of magazines such as Pop, Dazed, and the Parisian and British editions of Vogue. And, to embody this Paule Ka woman and the communicative joy of living is the famous supermodel and Czech actress, Karolina Kurkova. 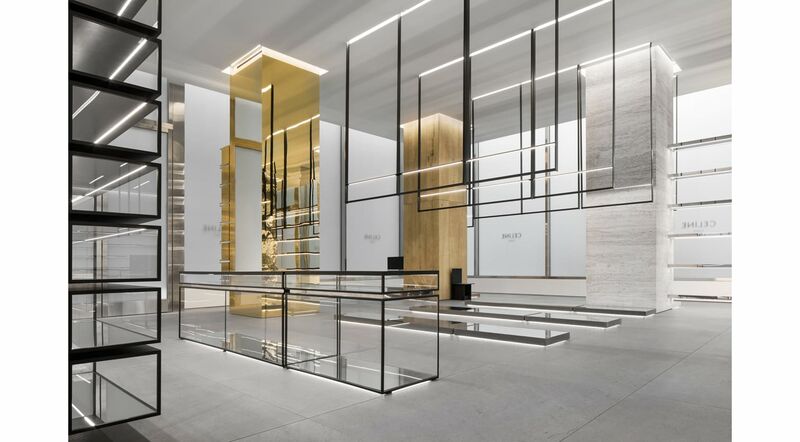 A NEW ARCHITECTURAL DESIGN CONCEPT FOR CELINE BOUTIQUES WILL LAUNCH WITH NEW YORK MADISON AVENUE IN FEBRUARY 2019 AND SUBSEQUENTLY IMPLEMENTED WORLDWIDE. 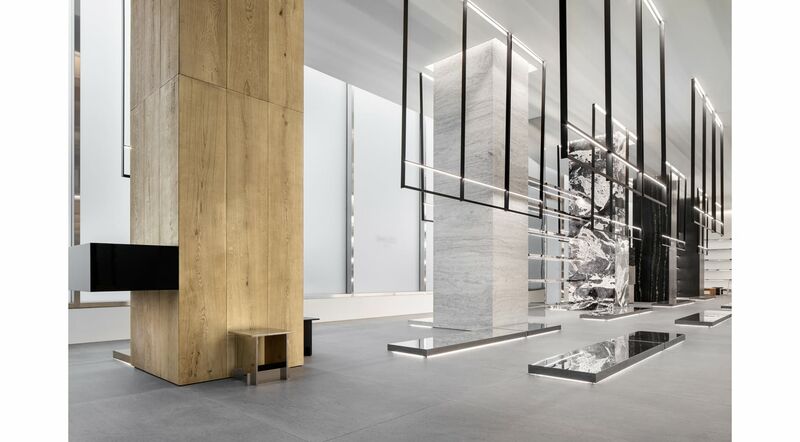 THE SCHEME, DESIGNED BY CREATIVE DIRECTOR HEDI SLIMANE; JUXTAPOSES THE FINEST NATURAL MATERIALS, CRAFTING A BALANCED AND EXPANSIVE SCULPTURAL INTERIOR. NATURAL STONES ARE AN ESSENTIAL INGREDIENT OF THE CONCEPT. BASALTINA, A ROMAN LAVA STONE, IS EMPLOYED FOR FLOORING. A GINGER AND CREAM-VEINED BLACK GRANITE IS USED FOR WALLS AND SHELVING. BIANCO RAFFAELLO MARBLE, GRANDE ANTIQUE MARBLE AND GREY TRAVERTINE ARE ALL ALSO USED IN VARYING COMBINATIONS. 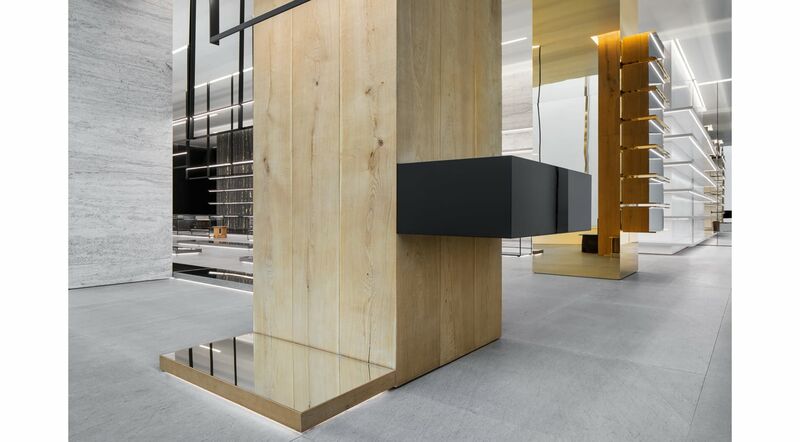 THESE MATERIALS ARE COMPLEMENTED WITH THE RECLAIMED OAK, CONCRETE, POLISHED STAINLESS STEEL, BRASS AND GOLD MIRROR TOGETHER IN A REFINED TWENTY-FIRST CENTURY BRUTALIST CONTEXT. 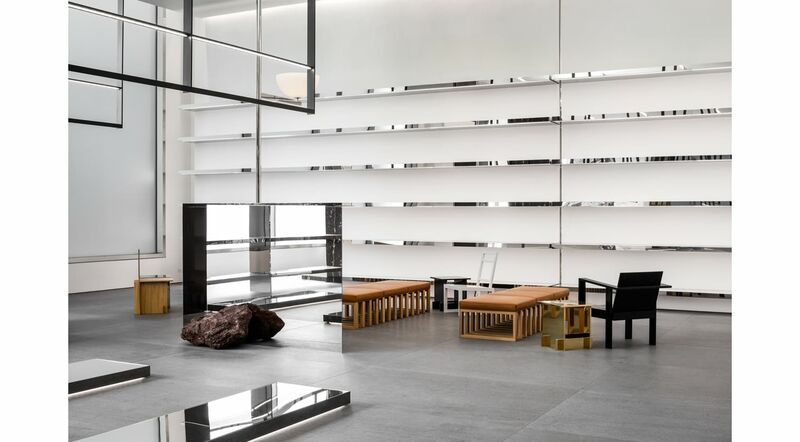 SPECIALLY DESIGNED FURNITURE BY SLIMANE PLAYS A CRUCIAL ROLE IN THE DESIGN, WITH SCULPTURAL TYPOLOGIES RESPONDING TO THE ARCHITECTURE. 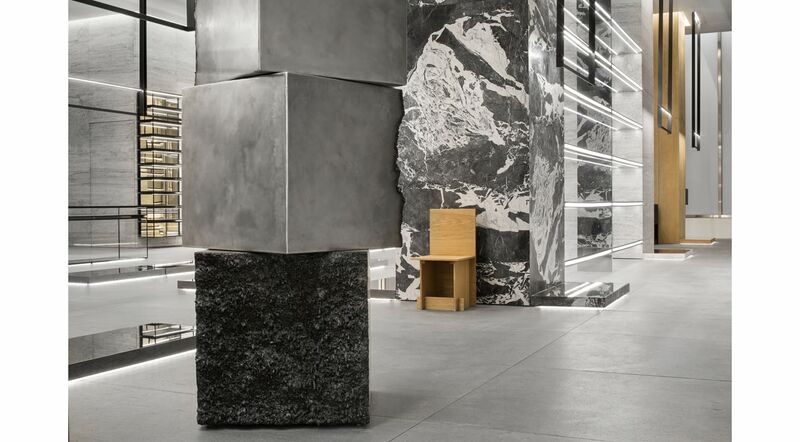 SITE-SPECIFIC ARTWORKS ARE ANOTHER KEY COMPONENT FEATURING CONTEMPORARY ARTISTS SUCH AS JAMES BALMFORTH, JOSE DAVILA, ELAINE CAMERON WEIR AND OSCAR TUAZON. 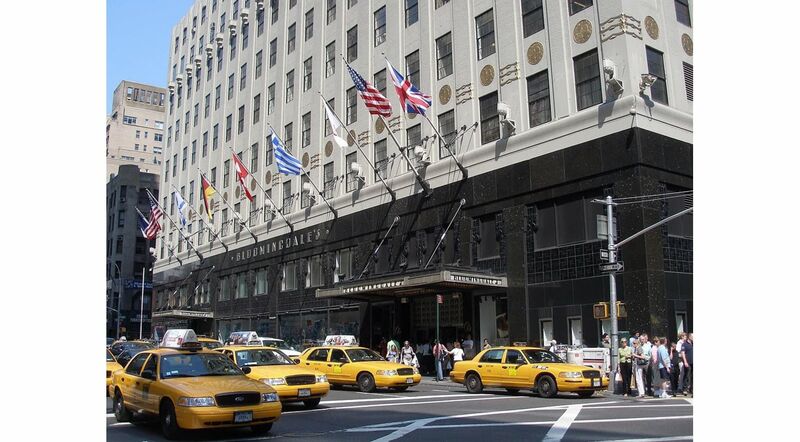 Dondoks will be launching their 3rd collection exclusively in 4 Bloomingdales stores! The Summer shoe brand will be available in New York , L.A and on their website. combined with a new “casual” energy that modernises masculine codes. In a unique blend of relaxed and classic chic, resistant and sophisticated Taïga leather is combined with the Monogam canvas in a graphic mix of materials. 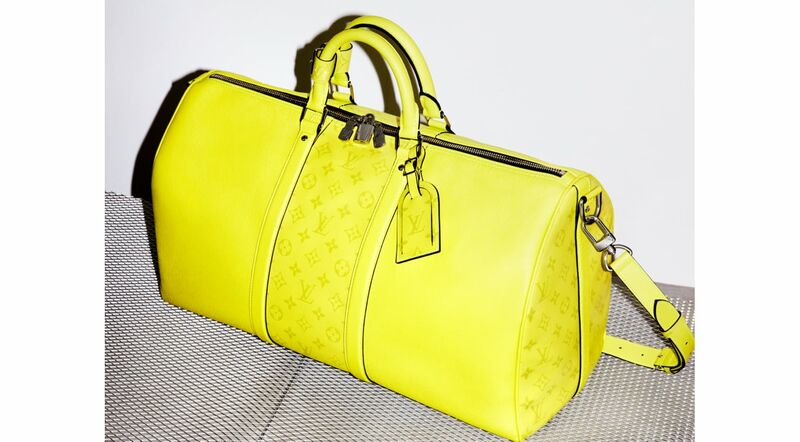 From bags to accessories, the collection offers a variety of supple, urban, contemporary shapes. 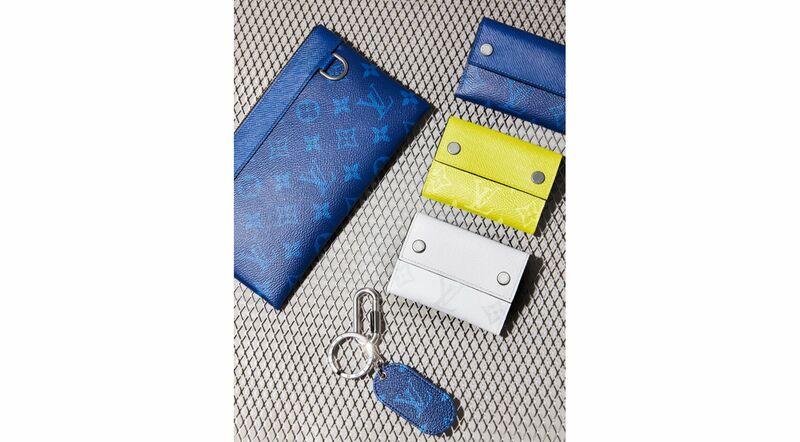 Discovery zip pouches, compact wallets and flexible cardholders add a final touch to the collection. An invitation to fully experience summer exoticism, the bright or acidic shades evoke an imaginary voyage to the antipodes. Synonymous with the sun and the promise of adventures, Bahia yellow, Amazon green and Pacific blue can be found alongside Antarctic grey and the famous Eclipse shade in grey and black shadowy tones. The Taigarama line will be available from 22 March 2019 in Louis Vuitton stores and on louisvuitton.com. JW Anderson is proud to release the brand’s Spring Summer 2019 campaign images and video. The campaign was shot by Julie Greve, a UK based photographer and one of the three winners of the JW Anderson YOUR PICTURE/OUR FUTURE competition. 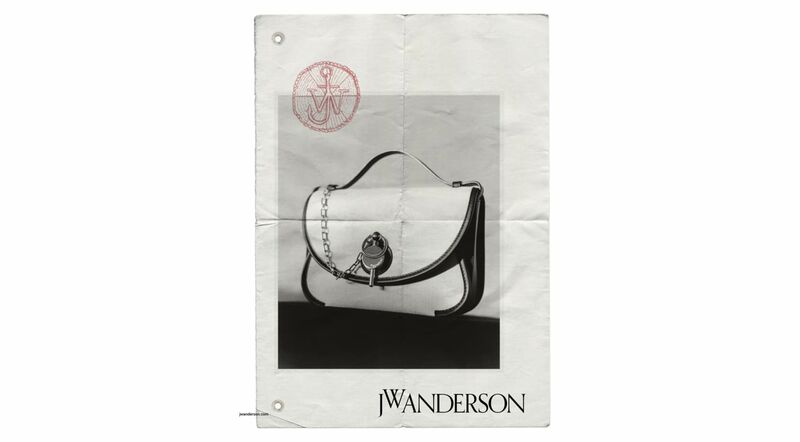 The competition, launched at the beginning of 2018, was an international search for new talent and an occasion for the brand to further develop the youthful energy, enthusiasm and surprise that are core to JW Anderson. Greve was one of three winners selected from a group of over one-thousand-eight hundred 18-30 year old image-makers. Their initial project was a collaboration between the winners on the JW Anderson Autumn Winter 2018 campaign. The current campaign is the first shot exclusively by Greve. 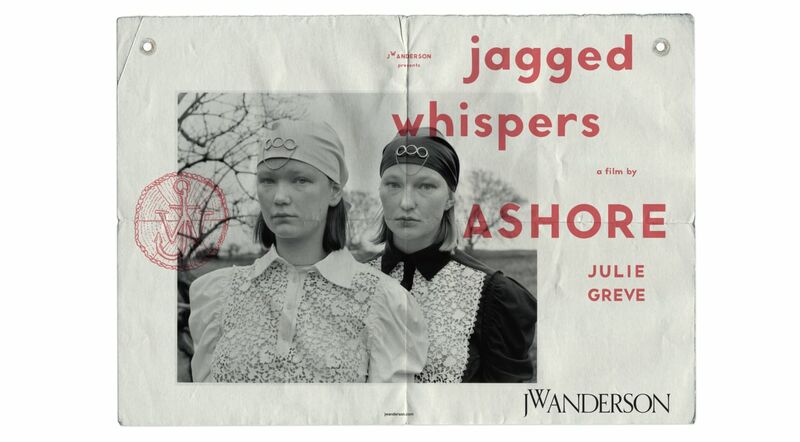 The campaign goes beyond just images with a short film entitled jagged whispers ASHORE. The film is referenced in certain images from the campaign and live on the JW Anderson website and the entire project was supported by industry leaders including Jonathan Anderson, Benjamin Bruno and M/M Paris who provided their expertise and guidance. Given the success of the first YOUR PICTURE/OUR FUTURE campaign the brand plans to launch a second search at the end of 2019. The competition will remain international but will receive the support of The Princes Trust, a UK charity founded by Prince Charles and dedicated to helping underprivileged young people thrive by providing opportunities for them to build their skills and confidence. 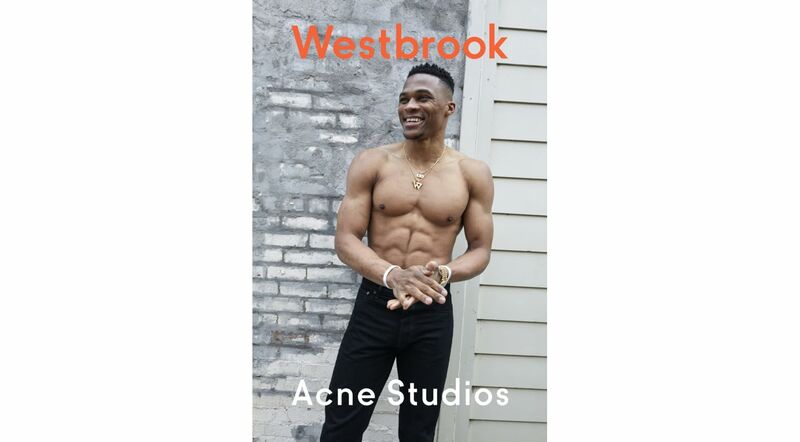 Basketball superstar Russell Westbrook, one of the most celebrated players of his generation, is the star of the Spring/Summer 2019 campaign for Acne Studios. Shot by acclaimed photographer Juergen Teller, the campaign focuses on denim, with jeans the first garment ever produced by Acne Studios over twenty years ago. 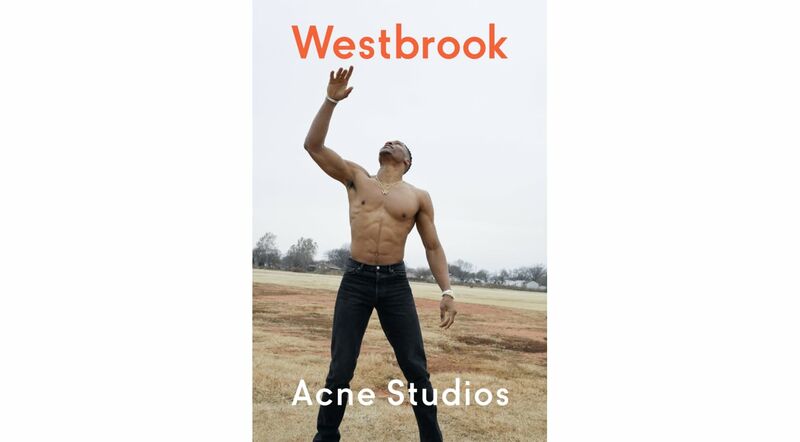 Teller travelled to Oklahoma, where Westbrook plays for the Oklahoma City Thunder, to shoot the campaign. “Denim is how Acne Studios started, and it still fascinates me. 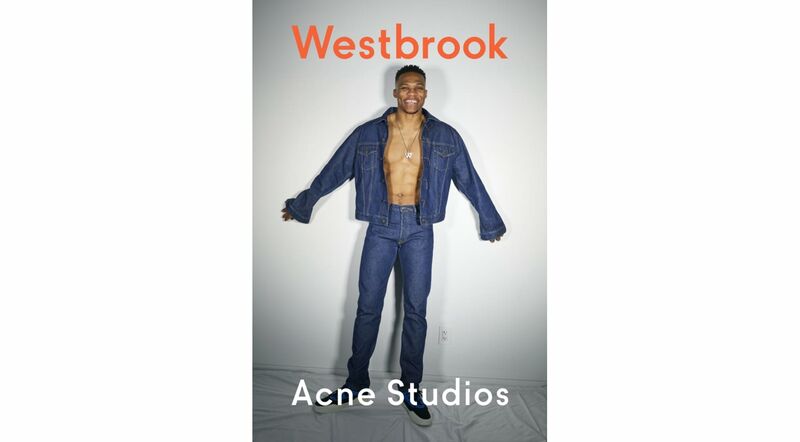 I’ve always wanted to work with Juergen Teller, and so we asked Juergen to photograph our denim on American icon Russell Westbrook,” says Jonny Johansson, Creative Director of Acne Studios. “I was already a huge fan of Acne Studios, so I was really excited when they asked me to be the face for their new campaign. 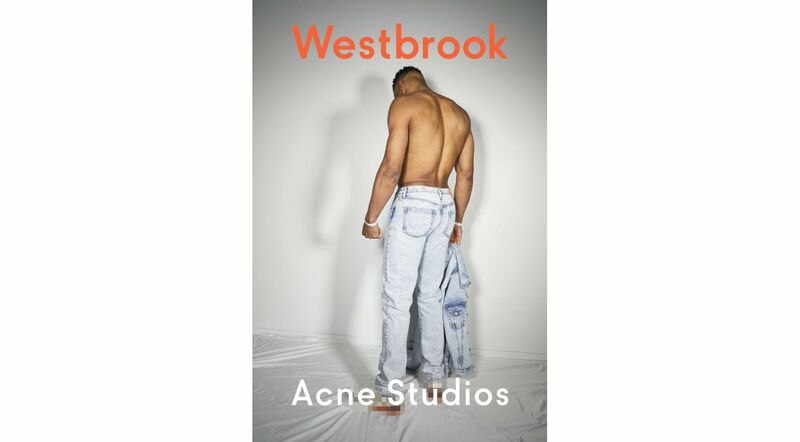 I really identify with Acne Studios because their aesthetic is very unique, and I like to be unique too,” says Russell Westbrook. 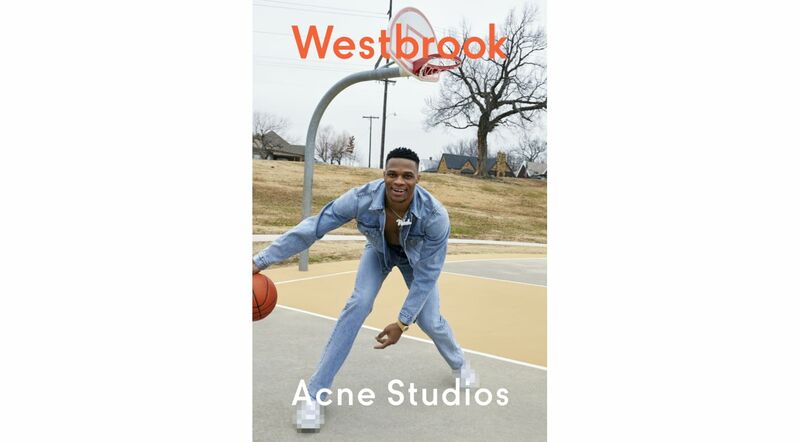 For his first campaign for Acne Studios, Juergen Teller has created a series of images that show Westbrook playing basketball in unexpected Oklahoma locations wearing Acne Studios denim. 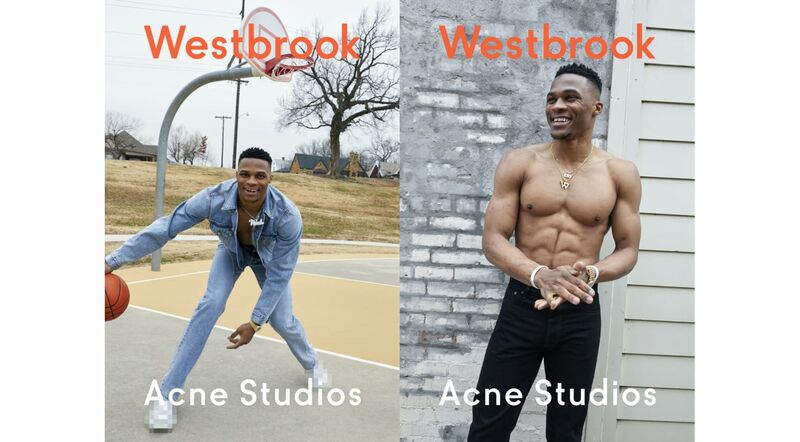 In some of the images, it’s as if Westbrook is dribbling the ball towards Teller himself behind the camera. All-Star, as well as two-time NBA All-Star Game Most Valuable Player. He is as idiosyncratic and fearless off the court as on, and is famous for his love of fashion, often expressing himself through his style. “I was very excited to shoot for Acne Studios. They seem so free and fun and experimental, and you can feel the sense of enthusiasm and excitement that they have. They were completely behind us, and when I have that trust I can open myself and make my best work,” says Juergen Teller.